51 Movies.I didn't quite get to one a week. If there were anything else showing in a theater near me tomorrow, I would probably hit that mark. But considering what's out there, if I were to see something, it would probably make it into this post. These are the WORST movies I saw this year. As usual, I must make a disclaimer. Even though I see more movies than most people, I'm still somewhat picky about my movies. I try not to see movies that are obvious total dreck. That's why I didn't see Parental Guidance this holiday season. The first reason I wanted to be sure I mention this is so that you notice that I didn't list A Thousand Words on today's post and think that it must be on my top 10 list. The second reason is that I broke that general rule this year. I feel justified in breaking it, as I'll explain, but I still feel bad about it. And this year, I almost broke that rule a second time. I made my way through James Patterson's Alex Cross books this past year. They aren't great, but they're fast, entertaining reads. I almost went to see Cross. Based on everything I've read, I dodged a second bullet; the first is still embedded in my gut. I'll return to that in a bit, as it doesn't stand alone on this list. Extremely Loud and Incredibly Close was Extremely Band and Incredibly Wretched. Tom Hanks is strange, and not in a good way.The plot is contrived and ridiculous. I will admit that there is a small twist at the end that brought some things together and made the mother's character, played by Sandra Bullock, make more sense. But it was too late at that point. I have no clue why this movie was nominated or even liked. I'll start my own riot and looting in downtown Concord if this wins. I debated over whether to put The Campaign on this list or just hide it away into my general writeup as forgettable. But it comes down to this. If a comedy isn't funny, it fails. The only funny parts were in the trailer. Beyond that? Very, very forgettable. I often forget that I usually don't care for Will Farrell. Anchorman, which I love, has totally screwed up my barometer for Ferrell. 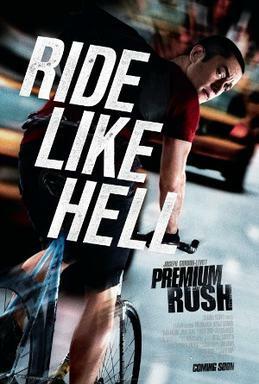 I felt strongly deceived by Premium Rush. It stars Joseph Gordon Levitt. He has been a superstar on my list over the past couple years with Inception at number 4 in 2010, 500 Days of Summer at number 2 in 2009, and the fantastic 50/50 scoring the top spot last year. I saw all four movies credited to him this year, and one of those is in my top ten. Also deceiving me was Michael Shannon. If you haven't seen Take Shelter, take a look. He's fantastic. And he's going to be General Zod, for crying out loud. In Premium Rush, both of these actors phoned it in. It felt like a bad surfing movie from the 90s. Actually, I think I'm being way too kind with that comparison. So what was the worst movie of 2012? The one I broke my rule for? First, here's my excuse. I was in Las Vegas. And that should almost be explanation enough, and it should be my cue to stop writing and keep that memory in Vegas. But I shall continue as a cautionary tale to others to stay away. So I was in Las Vegas, and I had to check out of my hotel by noon. But I wasn't done with that visit. I was meeting others later that day. I had to kill some time. Las Vegas is hot. I also wanted air conditioning. Casinos tend to cost money. So I went to the movies. 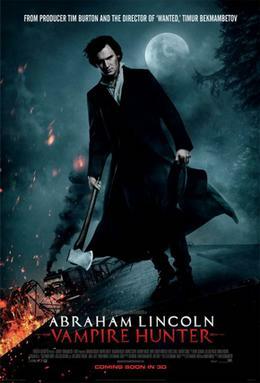 It was probably the heat of the Nevada desert that convinced me that Abraham Lincoln: Vampire Hunter would be a good choice. I perhaps tried to convince myself that it was also research for my job. It wasn't. It was bad. And not even in a campy way, which is probably its worst sin. It never took a moment to wink at the viewer to show that they were in on the joke. They weren't. I say the next part lightly, but also slightly seriously. And I don't even know if I can explain it correctly. I didn't like the historical inaccuracies in the movie, either. Yeah, the movie that added vampires to the Antebellum Period and put a crucifix in the hand of our 16th president. I say either make it totally accurate but with vampires OR just change history a la Quentin Tarantino. But don't have things that are just inaccurate. It was a miserable hour of my life. "Wait!" I hear you say. "It was only an hour?" No. I'm sure it was longer. But that's all I could handle. Yep. I left. I walked out of the theater. And that's a big deal. I don't walk out of movies. I can remember only two other movies that I've walked out of. One was The Milagro Beanfield War. But I saw that movie at the Capri way back in the late 80s. For those of you who don't know, they used to show two moves repeated. So if you pay for one movie, you get to watch the next. And repeat if you choose. So I went to see something else. I hardly count that one. The second movie walked out of is a lot more telling. It was in my San Diego State days. That movie was Mel Brook's Dracula: Dead and Loving It. I think I walked out of that one and walked into Father of the Bride II, which shows you just how bad that was. So apparently, I hate vampire movies with colons in their titles. It's a good thing I didn't see The Twilight Saga: Breaking Dawn: Part II.